In our dental office, we remove hundreds of wisdom teeth (a.k.a. 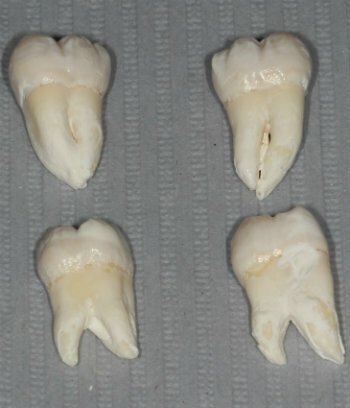 third molars) per year. 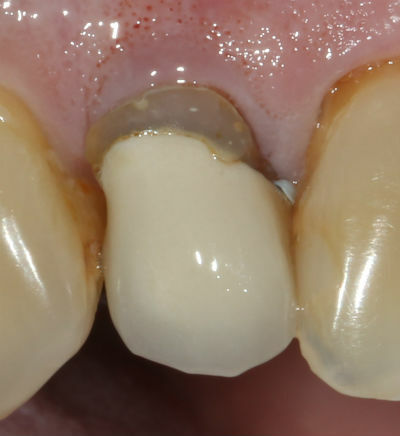 We perform all types of extractions – upper, lower, fully erupted, impacted, horizontal, etc. with our without IV sedation. Only 2 of these 4 third molars resulted in significant pain afterwards. Want to guess which ones? Surgery by Dr. Nicholas Calcaterra. Teeth are held in your jaw because they are encased in bone. The bone holds them tightly in place. So it stands to reason that if some bone is denser and can hold the tooth in more securely, those teeth will be harder to remove. Right? 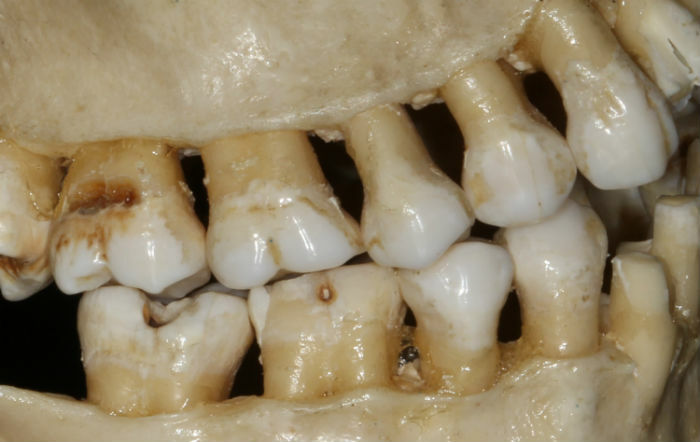 This photo of a human skull shows how teeth are held in place by bone. The bone that holds upper wisdom teeth in place is neither dense nor strong. It can best be compared to Styrofoam. On the other hand, the bone that holds lower wisdom teeth is dense, thick, and strong. It can best be compared to pine wood. So, if you have a tooth encased in either pine wood or Styrofoam, which do you think will require more effort to get out? Of course it’s the pine. So that extra strength that holds lower wisdom teeth in place – ends up resulting in greater effort to remove – and is one reason that makes lower wisdom teeth hurt more. Dry socket, also known as alveolar osteitis, is a painful condition that can occur after any tooth extraction. Research has shown that the incidence of dry socket for all tooth extractions is 2%, but is seen 20% of the time for impacted lower wisdom teeth. What this means is that, generally speaking, there is a 10 times greater likelihood of a dry socket with a lower wisdom tooth than an upper. This again is another reason why lowers can hurt more. Some of the other reasons for the difference in post-operative pain include the number and site of injections. To properly anesthetize an upper wisdom tooth, there are only a couple of injections needed. They are typically shallow and have high success rates. While one of the injections can be painful, it does not result in significant pain post-operatively. 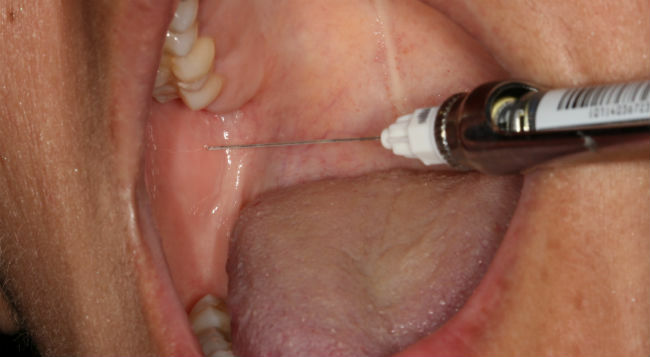 A mandibular block injection for a lower third molar. The needle goes at least one inch deep through muscle. Expect at least two of these injections for a lower wisdom tooth extraction. Conversely, lower wisdom will often need multiple injections, including a minimum of two that must penetrate at least an inch through muscle. And because lower wisdom teeth can have many nerves associated with them, it is not uncommon to need 5 or 6 separate injections. If you received multiple injections into your leg through one inch of muscle until the needle hit bone versus two injections where the needle only went in an eighth of an inch, which would hurt more the next day? After removal, there are empty sockets or holes where the teeth used to be. These holes are the perfect size for small pieces of food to accumulate. Significant accumulation of food can lead to delayed healing, infection, and pain. Gravity ensures that the lower sockets accumulate much more food debris than the top. This is another reason why lower wisdom teeth surgery leads to more pain than the upper ones. 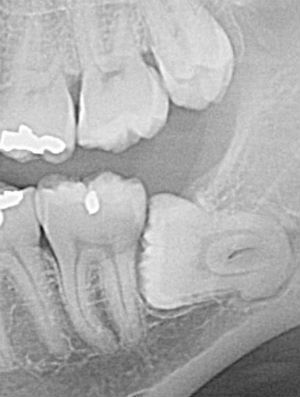 This impacted lower third molar is very close to a major nerve and artery. Impacted lower wisdom teeth are often close to very important anatomical structures such as a major nerve and artery that supply the lower jaw, chin, and other areas. In order to avoid inadvertently damaging those structures, a slow approach is often taken. The longer a surgical site it open and manipulated, the more post-op pain and swelling will result. And the greater a likelihood of infection. While upper third molars have their own set of considerations and risks, it is very rare that such a slow approach must be taken. In the x-ray, the upper wisdom tooth took approximately 1 minute to remove, while the lower over 20 minutes. Which site do you think hurt more the next day? Do you need a wisdom tooth or teeth removed? Interested in a consult? Want IV sedation? Call us at (203) 799 – 2929 or visit this page for an appointment. Lingual Frenectomies Aren’t Just for Kids! Large and restrictive lingual frenum in a teenage college student from Milford that we treated. Most people, and especially those with kids, have heard of the term “tongue tie.” Tongue tie, more accurately called ankyloglossia, is an abnormality in which the tongue has very limited movement due to the attachment of the frenum. The frenum is the thin band of tissue that connects the tongue to the floor of the mouth. See the photo to the right of a typical adult tongue tie. Severe cases of tongue tie are identified shortly after the infant is born. In those circumstances, tongue tie surgery – called a lingual frenectomy – is done early on. Failure to correct severe cases can lead to many issues including difficulty nursing, speech problems, and other problems. 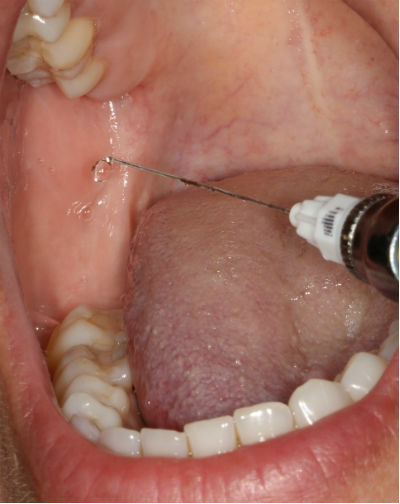 However, in many patients, the frenal attachment is not so restrictive as to warrant immediate treatment. But, as those patients age, and their faces and other oral structures enlarge and mature, the frenum can then become a hindrance. Treatment is then indicated. Before and after photos showing a closeup of her tongue. This is 3 weeks after the procedure. 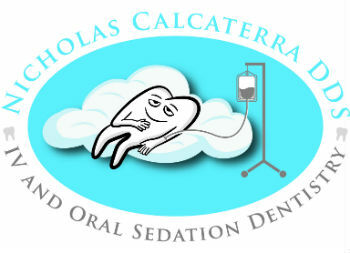 Photos and laser surgery Dr. Nicholas Calcaterra. In the above photos, you can see the pronounced frenum in the before picture. Notice how it is white? It is white because she is stretching her tongue with great force to allow us to even photograph it. In the after photo, it is relaxed, and her tongue is able to move much more. Prior to the laser tongue tie procedure, she could barely lick her lips. Now, she can extend her tongue beyond the borders of her lips. Surgery and photos Dr. Nicholas Calcaterra. The above photo shows the degree to which her tongue mobility increased after the procedure with the laser. In this case, her mobility increased by approximately a half inch. Pain in the frenum while yawning. A feeling that you are unintentionally “spitting” while talking. 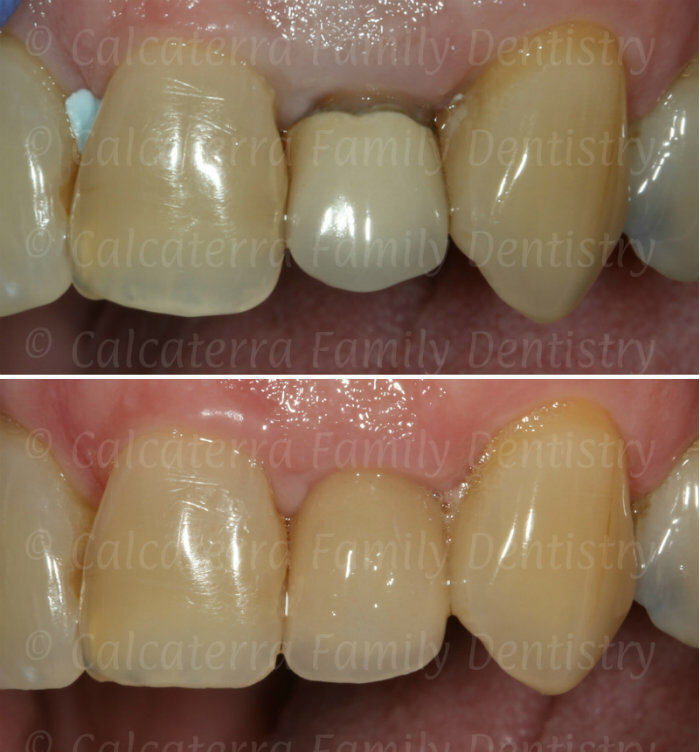 Rotation and/or crowding of the lower incisors. 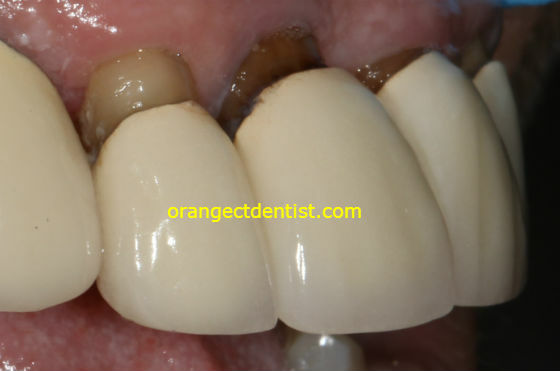 Recession of the gum tissue on the tongue side of the front teeth where the frenum attaches to the floor of the mouth. A desire to be able to lick your lips. Note that as a dental office, we can diagnose many issues related to the tongue and make treatment recommendations. But if there is a concern that the frenum is affecting the speech, we always recommend a consult with a Speech Language Pathologist. While we perform many labial frenectomies, we do our fair share of tongue tie procedures. So, as you can see, lingual frenectomies aren’t just for kids! Are you slightly tongue tied? Does your teenager or child have this issue? We routinely perform this procedure with our laser on patients of nearly all ages. Call us at (203) 799 -2929 or visit this page for more information.